Somewhere in this country a drive-by was avoided, a robbery was reconsidered, or a suicide attempt was abandoned because a teacher was willing to show up and make a difference in the classroom, administrative office, after school activity, or at the home of a child. » This Board’s For Me! Contributors this month: Graysen Walles, Hal Portner, Sue Gruber, Leah Davies, Todd R. Nelson, Marvin Marshall, Marjan Glavac, Barbara Pressman, Josette Bonafino, Rick Morris, Bill Page, Tim Newlin, Susan Fitzell, Alan Haskvitz, James Wayne, Hank Kellner, Howard Seeman, Dorothy Rich, Ambreen Ahmed, Barb Stutesman, Ron Victoria, Liz Phillips, and YENDOR. Thanks to the creativity and generosity of the Teachers.Net community, we offer the following printables for educators to use with their students. Just click and print! Be sure to bookmark this page and check back often to see what's new in Printables! I send these home with kids for a parent signature so the parents know how their kids are doing behavior/character-wise. I started using it this year, and I am going to continue using it. I have more parent contact now, more positive feedback, more help from home with behaviors, and students who have a better understanding of what my expectations are. A list of rules, with or without verbiage, hasn't worked as well as the rubric. I fill one out for each student and send it home. I circle/cross out what doesn't fit. I highlight the appropriate box for each behavior so that parents can read the box where their child is in the continuum. Parents sign and return the form so their child can have the 100 homework grade. I've only had one parent get upset, and I've had quite a few students get upset when parents take away their TV, cell phone, or video games until I send an improvement report (same rubric sheet) a week or two later. Since using this rubric, my classroom has been much easier to manage. Accountability has become more of a three-legged milk stool in that each student, the parents, and the teacher understand expectations and outcomes. Available in both Adobe Acrobat PDF and Microsoft Word DOC formats. When I was bogged down deliberating how to do Entry 4 documentation for the National Board Certification process, the issue of communication dominated. A child’s education is supposed to be a three-legged stool. Each leg represents accountability. One leg is the student’s, one the parents’, and one the teacher’s. A stool’s balance is precarious without proper balance, and I was forced to examine what I did or didn’t do to make sure the teacher leg was strong on nearly a hundred stools. I knew that rubrics help students understand how they get certain scores on assignments or standardized test essay prompts, but I had never considered going a step further—using a rubric for something that is not a standard of learning or a grade in my grade book. Could I use a rubric to report on one of the major factors that affects student success—the student’s ability or willingness to follow the basic school and classroom rules of conduct? The only way to find out was to try. The first time I sent a report home with mid-term grades, I included a letter with the rubric sheet. It explained to parents that optimizing a student’s experience at school means that the teacher communicates expectations to students and parents. I asked parents to review the rubric, which I had marked and highlighted so it was clear where the student was in the behaviors continuum. The student and parents were asked to sign the rubric and then send it back to school. I also sent a standardized test readiness report home during the fourth six weeks, so parents had a clear picture of strengths and needs on an academic level. While it was incredibly interesting to tie the corollaries between behaviors and academic success, I focused on three different tribulations—students with good grades and negative behaviors that impacted others’ cognition, students whose behaviors did not have a negative impact on their grades, and students with low skills and negative behaviors that the school discipline plan failed to facilitate change. There were some immediate results that came as a result of all those returned parent-signed behaviors-rules rubrics. There were parents who thought the rubric was an excellent idea, and while most of that feedback came from parents whose children scored in the high sectors of the rubric, there were a significant number of parents who claimed to be unaware of behavior problems in the classroom. Many of the behavior problems that disrupted class disappeared, which caused me to realize that if I had made parents aware of issues earlier—in the rubric format, many students would have scored higher from the beginning. In conferences with parents, I discovered that the rubric helped parents see what the expectations were and how their students either met or missed the marks on each target behavior. In the end, it was absolutely apparent to me that use of a behaviors-rules rubric helped me explain the “rules” to students in a graphic organizer that was far more useful and easier to understand than the student handbook text format provided by the school system. By giving progress reports using the rubric, parents and students could see where they were in a behaviors continuum that teachers generally assume is crystal clear. 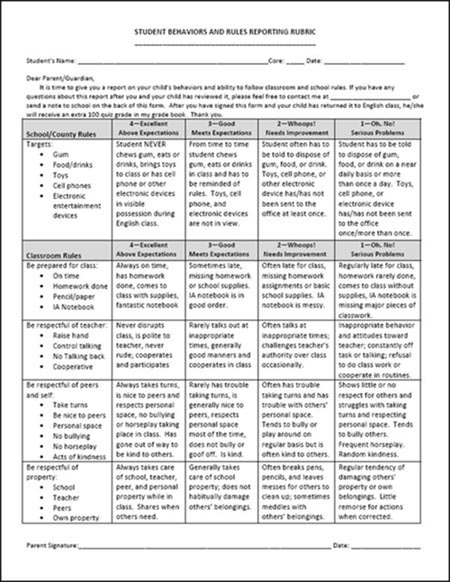 Since using this rubric, my discipline referrals to the office have almost disappeared, and I am able to offer opportunities for behavior modification by helping troubled students focus on one area of the rubric at a time. Positive behaviors make it easier to do my job, and students who have a history of disrupting instruction have more accountability—to me, to parents, and to peers. Liz is a career-change teacher who volunteered as a full-time tutor/mentor for eight years before going back to college to obtain a teaching license. That experience, coupled with her own struggles to be an “A” student despite having dyslexia and ADD dis/Abilities, has made her determined to help as many struggling students and educators as she can. 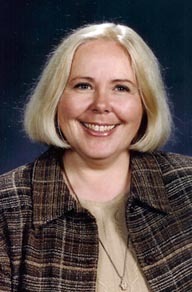 Her scientific interest in how students learn and retain knowledge came as a result of getting her Master’s degree in Reading at Emory & Henry College in 2006. Her hobbies include designing reading guides for young adult novels as well as differentiated inclusion lessons based on her students’ preassessments so that everyone enjoys some success. She also enjoys writing stories for her students and articles about teaching. Whenever she gets the opportunity, she presents at conferences and in-service trainings because knowledge and discovery are meant to be shared. Liz teaches English Language Arts at Wallace Middle School in Washington County, Virginia. She also tutors struggling readers by appointment and is a teacher consultant for the Appalachian Writing Project, a satellite of the National Writing Project. She lives in rural Southwest Virginia with husband Curt, daughters EmilySarah and Amanda, two dogs, and a cat—a sharp contrast to the nomadic life she experienced as a USAF dependent.